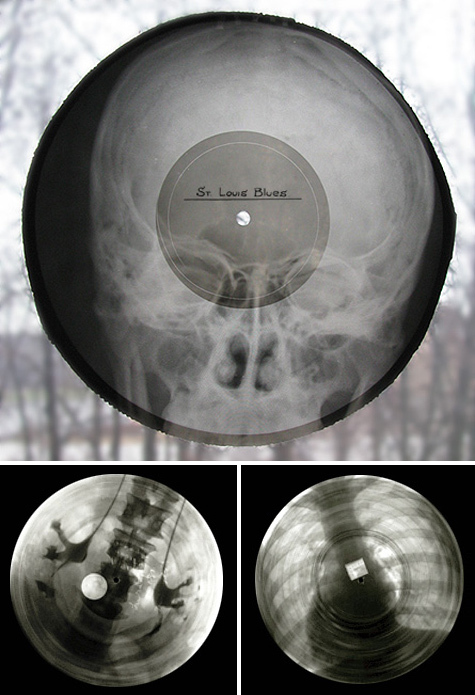 In Soviet Russia, albums were bootlegged onto old X–ray slides, a phenomenon known as roentgenizdat or dance on bones. Records on bones typically cost about 1.5 rubles…very inexpensive. 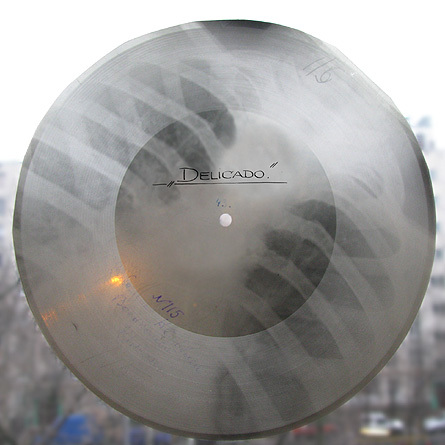 Up to 3,000,000 records may have been distributed on X-ray up through 1958. Joshua Rothman, “You spin me right round, like an X-ray,” The Boston Globe, 20 March 2011. “Jazz on Bones: X-Ray Sound Recordings,” Street Use, 28 August 2006. Artemy Troitsky, Back in the USSR: The True Story of Rock in Russia, (Omnibus Press: 1987). And here’s a link to a collection of photos and a video. If you click on the image of the X-ray being cut, you can see a video of them making a new Dance on Bones recording.